Mohamed Ali Rashwan is now an International Referee present in most of the IJF competition. But he is also an Olympic Silver medallist well known for his fair-play behaviour with Yasuhiro Yamashita in the Final of the Olympic Games. 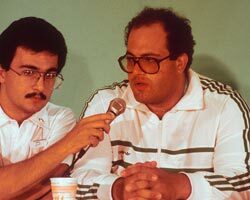 "In 1984, I was selected to represent my country at the Olympic Games in Los Angeles. I knew that in my category, the man to beat was Yasuhiro Yamashita and I was dreaming of meeting with him in the finals of the Games and of making every effort to dethrone him. 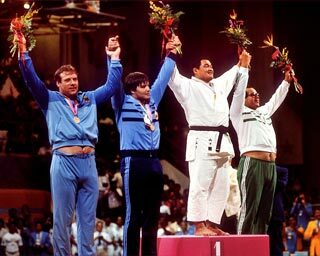 He was a true icon for all judoka at the time. © David FinchThe draw and the running of the competition granted me all my wishes. I won all my preliminary matches and in the final, I was slated to oppose the great Yamashita. Yet I knew he had injured his leg during the preliminary rounds of the tournament and that he was no longer in full possession of all his means. Actually, I did not want a victory like this. I did not want people to be able to say one day that I won because Yamashita was injured. I just could not accept it for myself. At that time, I tended to attack on both sides, left and right, but while standing on the mat for the Olympic final, I simply could not attack with force on the injured leg of my opponent. We went on ne-waza (ground work), he immobilized me and won the Olympic title. Of course, I was disappointed for myself but happy for him. During the press conference that followed, some journalists asked me if I knew about Yamashita's injury. I naturally said, 'yes and that's what really kept me from fighting'. For over a year I heard nothing about this story. 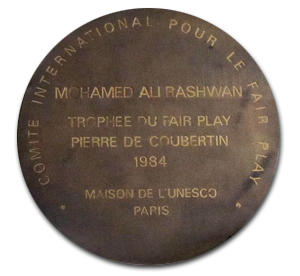 Then one day, I was contacted by the International Fair-play Committee which had awarded the medal of Fair-play for my action in the final of the Games. I was very proud." Even today, when Mohamed Ali Rashwan talks about his final loss against Yamashita, his eyes shine. But they do not shine from regret or disappointment, but with emotion. The man is proud and modest. He likes to talk about his "olympic adventure" as he knows that it has had an exemplary dimension. Regularly invited to Japan, where he is particularly respected, he explains to the younger generations that the most important thing is to respect each other. "Sport has too often become like a war," he says, "we must return to the core values of sport: an athlete must respect his/her opponent, the students must respect their masters, the referees must respect the competitors and vice versa." The photograph taken by Carlos Alberto Matos, during the last Judo Grand Prix, Abu Dhabi 2011, proves that Mohamed Ali Rashwan does not just talk, he acts. Heide WOLLERT, who was thrown against him while he was sitting on a chair, apologized. He explained to her that he did not mind and that there was no problem. The athlete and the referee showed that compliance is still possible. "German, Heide WOLLERT, is a charming young lady, who guides her moral by her self-respect and her manners by respect for others. Glad to have her as a friend."